AIM: To lead students to discover through Jesus’ dealings with Simon Peter that Jesus offers us forgiveness and responsibility while requiring that we keep our eyes off other Christians, and to accept God’s forgiveness and responsibility without comparing themselves to other Christians. Before class: Read the notes on John 21:1-25 found in the Sunday School Teacher Book. After reading each case study, ask the class, “If this person were your friend and had come to you for advice, what would you say to him or her?” Tell the students they should find answers to that question in today’s lesson. Tell the students this is our last lesson from the Gospel of John. Remind them that we have been in this study for six months. Ask: “What was last week’s lesson about?” (the resurrection of Jesus and how we should live as a result of it). Ask if any volunteers would be willing to recite last week’s memory verse (John 20:21). 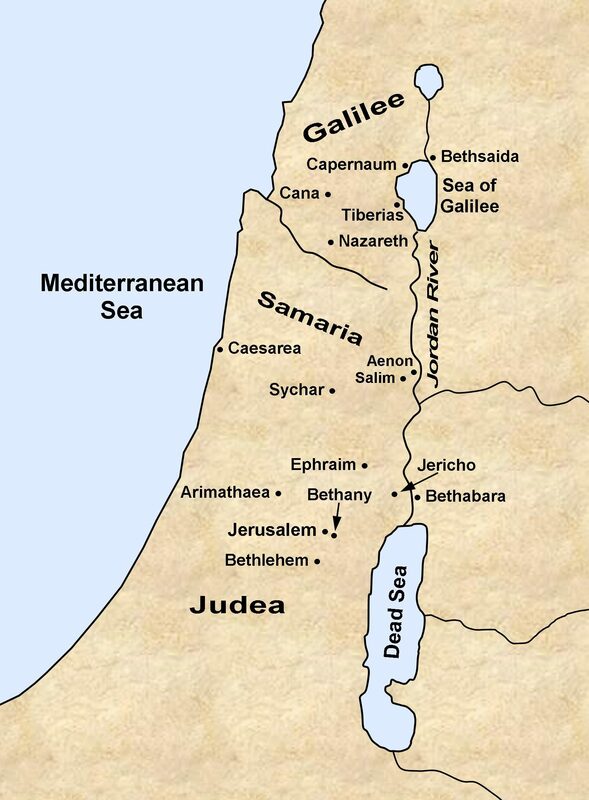 Explain that seven of the disciples were at the Sea of Galilee (Sea of Tiberias – locate the Sea of Galilee on the map). Tell the class that Peter led the group to go out in a boat and do some fishing. They fished all night. Ask: “What did they catch?” (nothing). Tell the students in the morning they saw a man standing on the seashore. The man told them to cast their net on the right side of the boat. When they did, they caught a huge catch of fish. Ask: “Who recognized that the man on the shore was Jesus?” (John). Explain that Peter swam ashore while the others rowed the boat to shore, dragging the net full of fish. Ask: “What did they find when they got to shore?” (Jesus, who already had a fire burning and fish laid on it). Note that after following Jesus’ instruction the disciples caught 153 fish – more that their net should have held – but the net was not torn. We should always obey Jesus’ instruction. Ask a volunteer to read John 21:12-14. Ask: “Did the disciples know who Jesus was?” (yes – see verse 12). Ask: “What did Jesus do for the disciples?” (He fed them fish and bread). Tell the class this was the third time recorded in the Gospel of John that Jesus appeared to His disciples after His resurrection. The fact that He ate with them proved He wasn’t just a spirit or a vision. Summarize: Jesus appeared once again to His disciples, this time at the Sea of Galilee. He demonstrated His deity through a miraculous catch of fish and provision of food. He proved He was really alive by eating with them. Jesus Offered Forgiveness to Peter. Ask: “Why do you think Jesus questioned Peter about his love, but not the rest of the disciples?” (Peter was the one disciple who had verbally denied Jesus three times, so Jesus gave Peter the opportunity to verbally state his devotion to Him the same number of times). Draw two vertical lines on the marker board or chalkboard to create three columns. Write the words “Verse 15,” “Verse 16,” and “Verse 17” as headings of the columns. Explain to the class the difference between the Greek words agape’ (the highest and noblest form of love, used to describe God’s love for us) and phileo (friendship or brotherly affection). Read verse 15 again. Tell the students in that verse Jesus used the word agape’, but Peter used the lesser word phileo. Tell the class in verse 15 Jesus asked Peter if he loved Him more than the other disciples loved Him. Remind them that Peter had previously claimed to be more devoted to Jesus than anyone else (see Matt. 26:33-35; Mark 14:29-31; John 13:37). Read verse 16 again. Tell the students in that verse Jesus again used the word agape’ and Peter again used the word phileo. Read verse 17 again. Tell the students in that verse Jesus came down to Peter’s level by using the lesser word phileo, while Peter used the word phileo for the third time. Summarize: Jesus offered Peter forgiveness and restoration of fellowship, even coming down to Peter’s level to offer it. Peter was now broken from his boasting and bragging – ready to be useful to the Lord. Jesus Told Peter to Get Back to Work. Tell the students many Christians, after sinning or failing the Lord in some way, feel unworthy to serve the Lord in the future. This is one of the devil’s common attacks against Christians. Ask: “What did Jesus tell Peter to do after Peter answered each question?” (“Feed my lambs” or “Feed my sheep”). Summarize: Jesus wanted Peter to get to work, not dwell on his past failures. We should do the same. Jesus Told Peter to Focus on Him, Not Others. Ask a volunteer to read John 21:18-25. Ask: “What do you think Jesus meant in verse 18?” (He was foretelling Peter’s death by crucifixion, which came some 35 years later). Tell the class in verse 19 Jesus told Peter to follow Him. Ask: “Who did Peter see when he turned around?” (John). Ask: “According to verse 21, what was Peter’s concern?” (what would become of John; would he also die a martyr’s death). Explain that Peter took his eyes off Jesus and began wondering if another believer would suffer and die a martyr’s death as the Lord said Peter would. Ask: “How did Jesus answer Peter’s question?” (someone else’s fate is none of your business – your responsibility is to me). Tell the class Jesus’ command at the end of verse 22 is very emphatic: you follow me! Summarize: Jesus told Peter to focus on following Him and carrying out the ministry He gave him, not on the work, status, or fate of other believers. Stan: You must accept God’s forgiveness – 1 John 1:9 – and forgive yourself. Pamela: You must submit to the advice and counsel of your teacher (and/or other church leaders) and take on whatever job they give you – no matter how menial or insignificant – when they tell you it is time to do so. Mark: You must focus on serving the Lord for however long He lets you live, without being envious or comparing your situation to that of other believers. Tell the class we must accept God’s forgiveness and responsibility without comparing ourselves to other Christians. Ask: “Is that ever hard to do?” (yes). Tell the students when we are confronted with spiritual truth we should accept it and apply it to our lives. Ask everyone to bow their head and close their eyes. Say: “If any of you are carrying around guilt over some past sin, you need to accept God’s forgiveness and put that sin behind you. If any of you feel that your past failures disqualify you from serving the Lord, you need to accept the responsibilities God has given you and get back to work. If any of you feel sorry for yourselves and have your eyes on other Christians, you need to get your eyes back on the Lord and follow Him.” Lead a closing prayer of commitment to do those things. CONCLUSION: Be sure everyone has a Sunday School Member Quarterly for the new quarter. Tell them during the months of March, April, and May we will study the Old Testament books of Ezra, Nehemiah, and Esther. Encourage them to read the introductory material, begin the Daily Bible Reading Guide tomorrow, and study the first lesson this week.